Hitachi? IBM? What do they have to do with it - you can ask us... 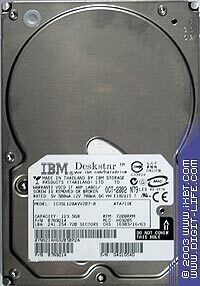 The matter is that on January 6, 2003 the hard drive industry gave birth to a new company Hitachi Global Storage Technologies which combines the subdivisions of IBM and Hitachi dealing with HDD production. At the beginning Hitachi possessed 70% of the business, but by the end of 2005 it's going to become the only owner. That is why formally IBM drives do not exist anymore. But taking into account that the drive of the new line that we have just tested has the stickers "IBM", is entirely developed by IBM and this trade mark is better known on our market, I hope the company will forgive me if I further call the drive IBM Deskstar (current Hitachi Deskstar). The new line Deskstar 180GXP is a follower of the Deskstar 120GXP and certainly the developer used the technologies which proved to be successful in the previous families. They are load-unload ramp, Tagged Command Queuing (TCQ), Drive Fitness Test (DFT), temperature monitoring, TrueTrak servo and No-ID sector formatting. Among the improvements are fluid dynamic bearings (FDB) instead of the bearings with ceramic balls and an onboard processor of the new generation; the head positioning system is also improved because of the higher write density. At the same time, I don't see any more glass plates and antiferromagnetic coating (AFC) which the engineers at IBM were so proud about in the 120GXP line. I didn't disassemble this drive, but even if I did it I wouldn't be able to notice a ruthenium layer of 3 atoms, that is why I can't say anything definite about what happened with these innovations. The technical characteristics of the drives of the new line are given in the table. This information is available in the datasheets. Let's see what do they mean by buffer size. It seems that the models with an 8MB buffer have the figure 1 after the hyphen in the code. Three-disc models (180GB) have only an 8MB buffer, one-disc solutions (60GB) have only a 2MB one, and 120GB models can have both types. Apart from the changed buffer in some models, the new line has the record density increased from 40 to 60 GB per platter. I tested the IC35L120AVV207-0 disc of 120GB with a 2MB buffer. Here are also the results of the IC35L120AVVA07 model of the same size for comparison. The test suite is also standard. The exchange rate is very close to the specified one. Of course, the new drive leads here. But the linear reading line is not that good. It's quite a problem to find 31 zones on it. Sure, the average speed is also higher. The access time is a bit higher, which looks logical as the record density is greater, but still, it doesn't exceed the stated limits. Note that low access time is a trump card of the IBM's discs. In the High-End WinMark the scores are only a little better, and in the Business WinMark they even worsen. The new models in Business WinMark lag behind because the test works with files of too small size (it's still 1999) for modern algorithms of operation with cache. The fact that it also happens in the drives from other manufacturers proves this supposition. A small advantage of the drive from the Deskstar 180GXP line is probably accounted by its better access time. I the random writing the new line is ahead. To define a place of the new line on the market, look at the summary diagrams covering the latest models from the leading companies. The linear reading and especially writing speeds are quite good. As I already said, the IBM leads in the access time. At high loads the new disc from IBM is above all. By the way, the advantage is achieved at the expense of the faster recording, i.e. 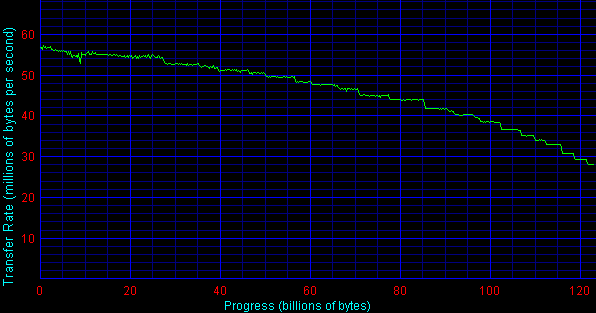 the good firmware performance. The new line is an extension of the Deskstar 120GXP line. A user gets discs of the greater size of almost the same performance and improved acoustic characteristics (thanks to the fluid dynamic bearings).